This cast iron octagonal clock tower has four clock faces and a pyramidal top. It was made in 1878 by W. Cunliffe in London and there are several plaques on it embossed 'Presented to the Town by James Scott 1878'. It has been repainted and restored and the clock faces are now lit with coloured lights at night. Vaguely Gothic, cast iron, octagonal shaft, four clock faces, pyramidal top. Made 1878 by W. Cunliffe of London. Bears several plaques embossed 'Presented to the Town by James Scott 1878'. Repainted in recent years. Very attractive. 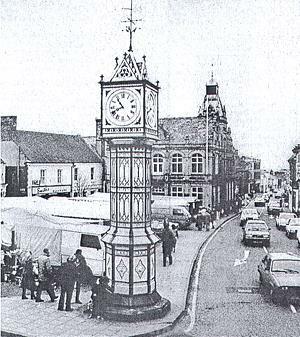 As part of the redevelopment of the market place the clock face has had coloured lights inserted into it. --- Newspaper Article: 1985. Eastern Daily Press. 7 August. --- Newspaper Article: 1988. Eastern Daily Press. 29 April. 2. --- Newspaper Article: Eastern Daily Press. 1990. 31 December.